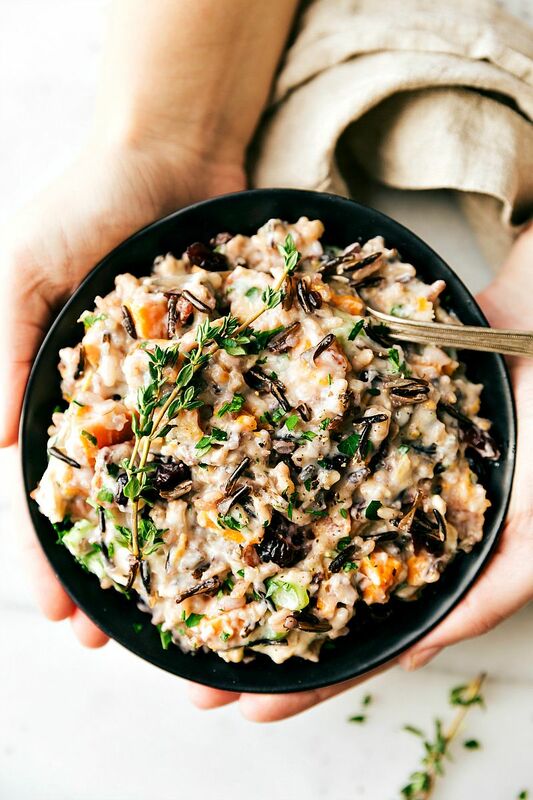 Slow cooked creamy chicken and wild rice casserole — easy prep and packed with flavor! Today we’re pulling out the crockpot and serving PURE comfort food. It’s basically like a creamy chicken and wild rice soup but in casserole form. How do you do comfort food better than that?! It’s the perfect cold weather meal! As we think of creative dishes for Thanksgiving, Friendsgiving, or otherwise, this dish is the perfect alternative solution if you’re looking for something beyond the classic Turkey. This meal has a little bit of veggie prep, but not too much so it can still be prepped quickly. If you’re in a hurry you can grab pre-chopped veggies at the grocery store — there is usually a carrot-onion-celery mixture which is exactly what you need in this casserole. I also throw in a chopped sweet potato because I adore them, but that’s totally optional. 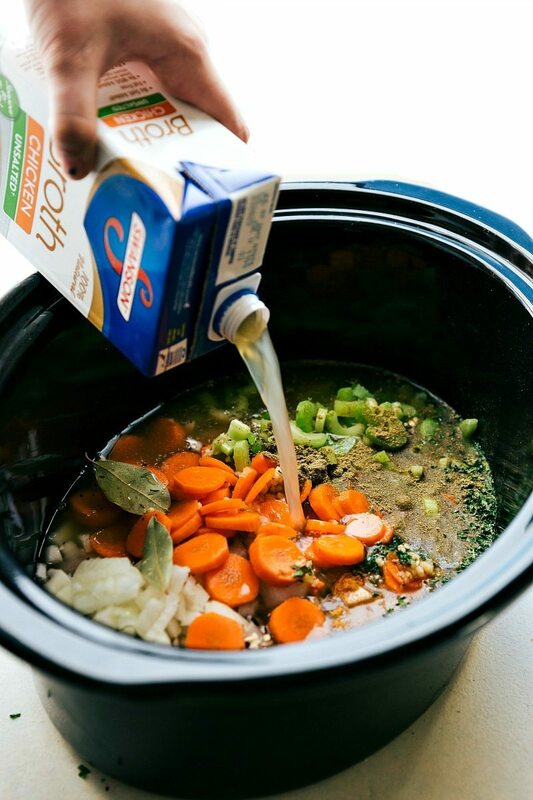 In addition to those veggies, you can throw the rest of the ingredients into the crockpot. There aren’t a whole lot of seasonings needed because I use chicken broth instead of water to cook the base of the casserole. Using chicken broth greatly elevates the end flavor of this dish. The texture of the rice after slow cooking and adding to the creamy base ends up like a rich and creamy risotto. The rice is ultra-soft and melds perfectly with the cream addition. I use a wild rice blend in this casserole. Watch carefully what you buy — if you happen to get black (also called forbidden rice) it will turn your entire casserole purple! You’ll also want to watch the cooking time a bit. Unfortunately this casserole doesn’t do well on low settings in the crockpot — it ends up with very unevenly cooked rice. At the high setting there will be variation in times since every crockpot is different. My crockpot cooks this casserole (tender rice and completely cooked chicken) in almost exactly 3 hours. If your crockpot tends to run hot yours might be done sooner so I’d check around 2 and 1/2 hours. Crockpot that runs cooler could take up to 4 and 1/2 hours. You’ll know it’s done when most of the liquid has been absorbed and the chicken shreds easily. 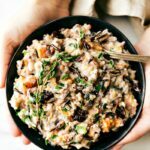 A risotto type creamy chicken and wild rice dish all made in the crockpot! Generously grease a large crockpot. I use a 6-quart crockpot for this recipe. Trim the fat from the chicken breasts or thighs. If using chicken breasts, cut each breast into 2-3 even pieces (so they will cook at the same rate as the rice). In a fine mesh strainer, rinse the wild rice blend to remove excess starch. Add to the crockpot. Prepare the veggies: dice an onion, thickly coin a carrot, slice celery, and chop the sweet potato into bite-sized pieces. Add to the crockpot. Add in the minced garlic, poultry seasoning, dried parsley, paprika, salt and pepper to taste (I use about 1 teaspoon of salt and 1/2 teaspoon of pepper), and bay leaves. Pour 3 cups of chicken broth over everything and stir. Cover and cook on high for 2 and 1/2 - 4 and 1/2 hours or until the chicken is cooked through, rice is tender, and most of the liquid has been absorbed. I do not recommend cooking this dish on low. Near the end of cooking time, melt the butter in a small pot over medium heat. Whisking constantly, slowly add in the flour. Whisk the mixture for 1 minute. Very slowly whisk in the remaining 1 cup chicken broth. Allow the mixture to thicken. Again, very slowly, whisk in the whole milk. Allow the mixture to thicken. Shred the chicken in the crockpot and then add in the cream mixture, cheddar cheese, and if desired sliced almonds and fresh chopped parsley. Taste and add any other seasonings to taste such as a pinch more of salt and/or pepper. *Make sure you purchase a WILD RICE BLEND. Regular wild rice or black rice (forbidden rice) will turn the casserole purple. I do not recommend getting a wild rice blend from a box with seasoning mix in it. **Poultry seasoning can be found near all other spices. It is very important to not omit this because it adds quite a bit of flavor. This recipe looks great and just what I’m looking for. Can I substitute almond or concomitant milk for the whole milk? I cannot have dairy right now while breastfeeding my gassy baby. Thank you Stephanie! 🙂 I wouldn’t recommend coconut milk because I think that would really change the flavor. Almond milk will be okay, but it won’t thicken up much or taste super creamy, but it should be okay! Let me know if you end up giving it a try! Thank you for your feedback, I’ll let you know! This looks delicious! Love crock pot meals 🙂 Loving the look of your new site!! I gave this recipe a try yesterday with a few adjustments and it was a real crowd pleaser! I will say that with my Crockpot it took the full 4.5 hours to cook though, so I should have planned a bit more for that possibility! Instead of raw carrots and celery, I used an 8 oz pack of mushrooms and a mixed veggie mix from the freezer section that I thawed. Next time I will probably sautee the onions and garlic for a more caramalized flavor and add in the sweet potato (my uncle was coming and doesn’t like them!) Thank you so much for sharing this simple recipe- my boyfriend can’t wait until I make it again! Just made this in my crockpot today. It was a hit with my husband. Thanks for a great recipe! Looking at your Christmas Treat Mason Jars now. You have such great recipes. So happy to hear that! 🙂 Thanks for the comment Judy and your kind words 🙂 Have a happy Thanksgiving! Is it ok if I used a wild rice that was black? I accidentally bought one that is, and already put it in the crockpot ? Taste wise it should be just fine, it will likely dye your soup a light shade of purple though. Made this last night for dinner and it was a HUGE hit!! ? Thank you for such an awesome recipe!!! Love all the nutritional benefits it offers with the whole grains of the rice and the veggies! Love that it’s healthy! ? This was delish! 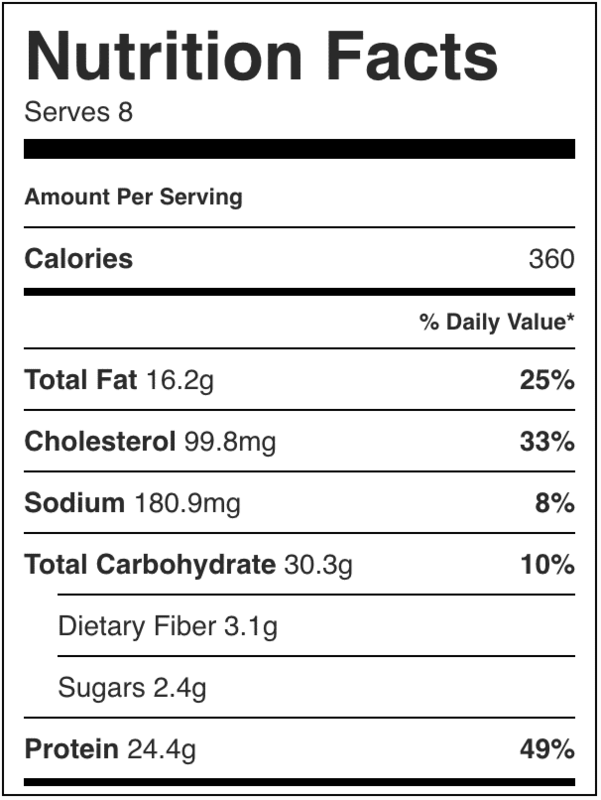 I added the sweet potato and loved the slightly sweet taste it gives. Also, instead of sprinkling shredded cheddar on each serving, I whisked it into white sauce. Loved it! Rated 5 stars although haven’t tasted yet – it’s in the crock pot now. Because I can’t follow instructions, I’m skipping the flour/butter and using a can of cream of mushroom soup. And I didn’t trim the fat off the chicken because I am a rebel. And there’s some leftover Texmati along with the wild rice. Hi! Planning on making this today. I know it is from two years ago, but I have a quick question. I only have basmati rice at home. Would that change anything much with the dish? Thanks. Hi Heather! It actually will; basmati rice cooks at a very different rate than a wild rice blend so I’d be worried your casserole would turn out very mushy.